The Outlaw is in charge. After acquiring the Iceberg Lounge from the Penguin, Jason Todd is running the show in Gotham. However, not everything he’s doing is just for drinking, partying and gambling. Below the surface, Jason is working to dismantle every single criminal operation Penguin has in the city. And the best parts? Penguin is being forced to watch it happen, and Batman can’t do anything to stop Jason. Here’s to outlaws. We start the issue with Jason gloating to Penguin that, despite all the talk about not crossing Penguin, Jason is not impressed. Jason reminds Cobblepot that if he wanted it, he would have killed him by now. As Jason leaves his office, Cobblepot comments that he has a contingency plan, and Jason must be a bigger idiot that he thought. As Jason walks through his casino, he runs into a gorgeous blonde in a red dress. He immediately recognizes her as Isabel (Jason’s ex from the New 52). The two walk off together and begin catching up. As Jason apologizes for ending their relationship, Isabel stops him and kisses him. However, the moment is interrupted by an explosion. On the other side of the casino, Penguin’s contingency plan has arrived in the form of five assassins calling themselves the Five Aces. As they prepare to find Penguin, they run into Suzie Su and her sisters, and the groups begin battling in the casino. Despite having the advantage for a bit of the fight, the Five Aces are quickly outmatched by the sisters, leaving only one of the Aces left. That remaining Ace tracks down Jason and Isabel and open fires on them. However, Miguel arrives and uses his powers to shield them, and hands Jason a briefcase. As he leads Isabel away from the fight, Jason opens the briefcase and dawns his Red Hood gear. 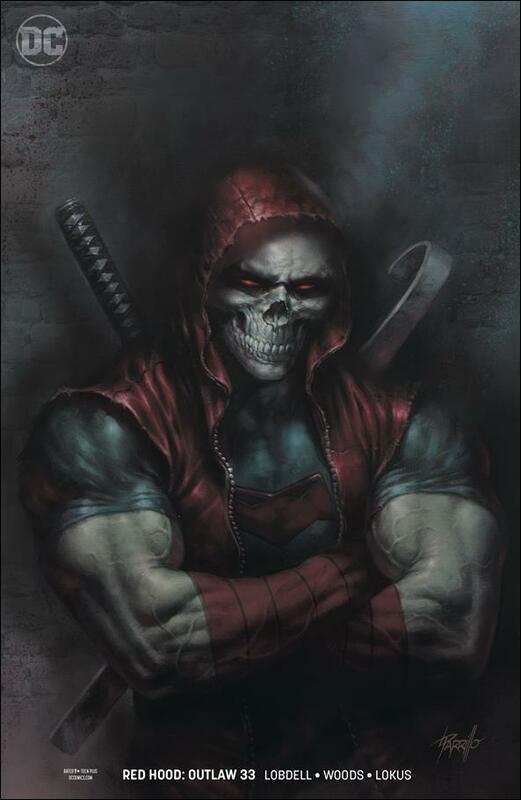 As Red Hood begins the fight, he immediately recognizes the assassin as a member of the All-Caste (one of the organizations that helped train Jason after his resurrection). The two briefly brawl, and soon Suzie busts into the room they are in. When she arrives however, she finds Jason with a drink in hand, and the assassin in a smoldering pile in the middle of the room. Once again, Red Hood ends up being one of my favorites of the week. I can’t emphasize how much I love Jason in this role. It feels like this is what he should have been doing the entire time. As I said when this arc started, I’m excited to see where this goes from here. And now that we have the reintroduction of Isabel to Jason’s life, it may lead to an interested dynamic that I don’t think we’ve ever really seen: Jason in an actual relationship. If the series keeps on its current course, this will end up being one of the best books from DC. So far, so good. Now let’s keep this Outlaw momentum rolling.